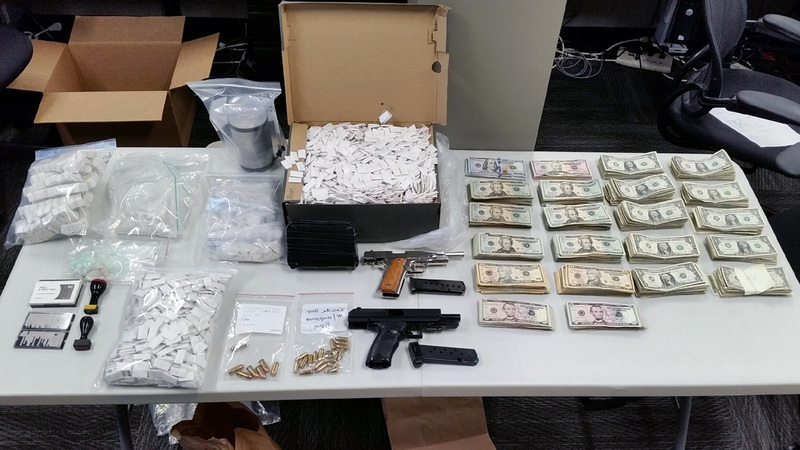 WHITE PLAINS, New York (WABC) -- Authorities in Westchester County announced a massive heroin bust Thursday that led to the arrests of 18 suspects and netted $1.5 million in drugs. The arrests were the culmination of an investigation that began last year but was greatly expanded and accelerated at the beginning of 2017. Investigators say the suspects were selling heroin to upwards of 25 individuals in and around White Plains, some of whom purchased heroin on a daily basis. They are all charged with felony criminal sale of a controlled substance, criminal possession of a controlled substance and conspiracy. "The defendants arrested include longtime drug dealers with lengthy felony records," Westchester County District Attorney Anthony Scarpino, Jr., said. "This coordinated, multi-agency effort targeted the right people to take off our streets." Police seized a combined total of two loaded handguns, 2.5 kilograms of heroin and more than $100,000 in cash.